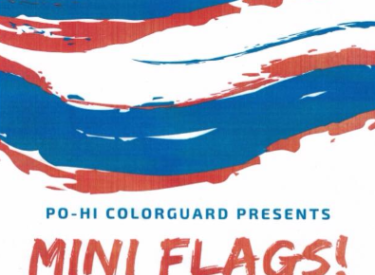 The Big Blue Marching Band and the Po-Hi Color Guard will sponsor their annual mini-flag clinic starting Monday, Aug. 27 at East Middle School. The clinic is open to all students in grades K- 8th. Students will work with Color Guard members to learn basic flag techniques as well as a routine to be performed at the first home football game. The clinic will run from 5 to 6 p.m. Monday through Thursday, and all participants will be eligible to perform at the half-time performance at Sullins Stadium on Friday, Aug. 31. The cost is $30 per person which includes registration, instruction, T-shirt, and a flag to keep. Registration will be held on Monday, Aug. 27 at East Middle School from 4:15 to 5 p.m. Please enter the building through the Sixth Street entrance. Participants may also register online any time before the clinic at https://goo.gl/JqghXb. Acceptable payment types are cash or checks and should be paid before the clinic begins. Students will need to be picked up promptly after the clinic ends each day and will not be permitted to leave until their parent or designee has come inside to pick them up. For more information, email Sarah Orr, Po-Hi Color Guard Sponsor, at [email protected].